I want a feeling of immediacy and simultaneity, as if all aspects of the work are happening at once. But I also want an underlying sense of structure. Color sugar lift, soap ground and spit bite aquatints. Image size: 15 x 11¼"; paper size: 20¾ x 16½". Edition 25. Published by Crown Point Press and printed by Courtney Sennish. Color sugar lift, soap ground and spit bite aquatints on gampi paper chine collé. Color sugar lift and soap ground aquatints with aquatint. Treib’s palette, like her motifs, is derived from memory. She doesn’t work with primary colors. Instead, she uses the recalled feeling of colors she might have observed while traveling: a landscape from a Spanish village, parts of a Roman Fresco, fragments from Pompei or odd color combinations that startle. Her muted colors oscillate between pale and saturated; they are contrasting in hue yet close in value. Treib has described “color as one of the most important elements—it contributes to the animation of the forms.” The painting combinations of teal blues, grays and browns are reminiscent of another era; they evoke the aesthetics of the 1950s. Treib received her B.F.A. from the School of the Art Institute of Chicago in 2001, and graduated with an M.F.A. from Columbia University in 2006, where she studied painting with Charline von Heyl. In January 2018, she completed her first project at Crown Point Press. Treib is represented by Bureau, New York; Galería Marta Cervera, Madrid, Spain; and Kate MacGarry, London, UK. 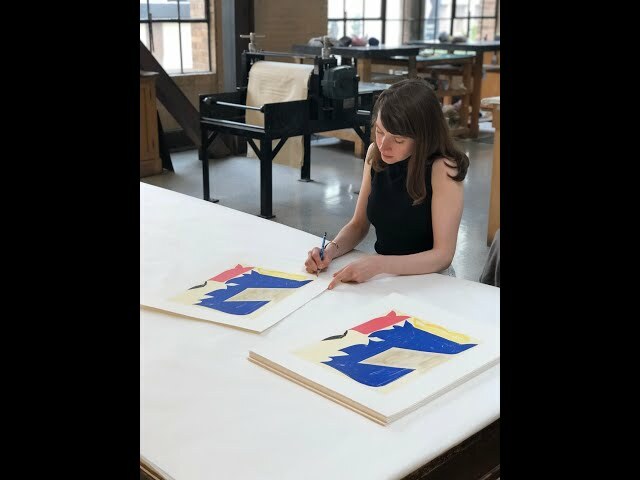 In addition to solo exhibitions in her galleries, Treib’s paintings have recently been exhibited in the 2018 Invitational Exhibition of Visual Arts, American Academy of Arts and Letters, New York. She lives and works in Brooklyn, New York. Watch this video of the artist working in the Crown Point etching studio, 2018.